Are you a Budget or Mid-Range Traveller? This is a very important question that will help us to design a customised trip that suits your budget and travel preference. Nepal is a great value, low cost destination compared to many other adventure holiday destinations around the world. (Not to mention the only country with eight of the ten highest mountains!). Now is a great time to visit Nepal, whilst prices remain fairly low and many of the trekking trails remain untouched. Budget trekking in Nepal is a great option for students and backpackers. Or maybe you’d like a bit more comfort? Don’t Expect Luxury During Your Trek! The standard of accommodation on most trekking trails is very basic. Some companies offer a ‘luxury’ trek option. But in reality, there are no ‘luxury’ teahouses by occidental standards. However it is possible to enjoy a higher level of comfort in Kathmandu and Pokhara. There are also various transport options available. Including different standards of bus travel, private transport, and of course the option to fly. What are Your Expectations for Your Trip in Nepal? If we understand your budget and travel preference, we can propose a customised itinerary and cost that suits you! Are you a budget traveller or a mid-range traveller? You’re happy to stay in basic city accommodation; eat simple, one-course meals during your trek; and travel by tourist bus to keep the cost of your trip as low as possible. 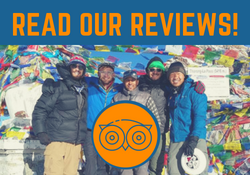 Budget trekking in Nepal is a great option for students and backpackers! You’d like a bit more comfort, but you still want great value! You prefer to stay in more comfortable city hotels; enjoy two courses at lunch and dinner during the trek; and have the option to fly or travel by luxury bus between Kathmandu and Pokhara. Regardless of whether you’re a budget or mid-range traveller, we’ll let you know your options. Having this information upfront just helps us to provide an itinerary and quote that more closely meets your expectations. Get my Customised Quote to Trek Nepal!